So, for those of you new to my blog, I am certainly glad you have given yourself one of the best opportunities to read insights from a long-time professional trader. The goal of this blog is to inform our readers with the clearest insight as to the who, what, why and how of modern economics. We pride ourselves in digging down deep into the subjects that matter, so that you the reader have a much cleaner understanding on how our financial system works. We realized long ago, well more specifically back in 2008, that the global central banks are and indeed ALL that matters. They have hijacked global markets via counterfeiting policies like the passage of TARP and all the following QE gimmicks since. It’s the FED that has taken the last stand, the BOJ embarked on this mission long ago and continue to buy up every private asset in site...fake demand = zero inflation, but we guess they want it that way. Anyhow after nearly 11 years we are proud to show you what we believe is the only thing that matters when one wants to cyclically value the equity markets. What might sound weird to some of you, then again, it might sound weird to most of you, is that it is the US bond market that gives us the signals for the US equity market. What do we mean? We mean that not even the might central banks can control the overall bond markets. They can peg short term rates, at a certain cost of course...most notably to savers, but the longer end 5 years and out is certainly much tougher to control. 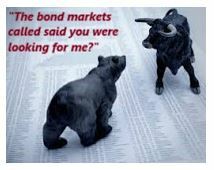 So, one of our favorite charts is once again saying the equity markets are full of arrogance and that soon, the bond bears will come hunting in the equity forest because we all know...he who holds the bonds holds the keys and as far as equity holders...your nothing but second class. In a financial system that has allowed for excess speculation, excess leverage, excess corporate debt for equity swapping, it is the finance, the capital structure that truly matters. When the cost of short-term financing rises above your ability to generate free yield...i.e. yield curve inversion, well then, the vig little piper comes a singing and he wants his vig whether you can pay it or not. 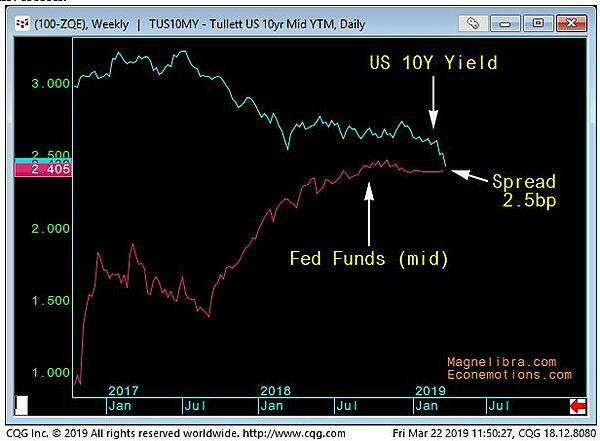 So, there you have it folks, you can keep buying equities in hopes that the central banks can control this inversion and move to an easing regime, or you can reduce your exposure and thank your lucky stars the Federal Reserve has gone from 4 hikes this year to never again in our lifetimes. Actually we aren't in the business of telling you what to do, that is unless you are a customer of ours, but rather think logically, think not in terms of return, but in terms of "time" how much can you afford to waste...till next time and pass this along to your buddies, who think they know more than you do, now you have the only chart you need to justify any of your actions, good, bad or indifferent...Your Welcome!